After dinner we wandered down Khao San road to check it out at night. Comparisons to Cavill ave in Surfers come to mind, definitely not my cup of tea. 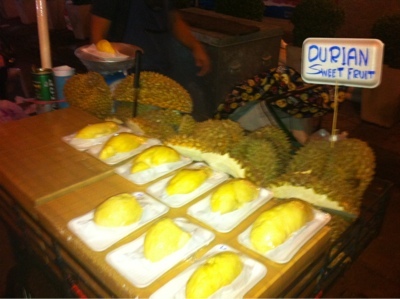 We did however find a vendor selling durian which is high on my list if must try foods. 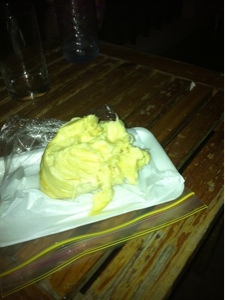 I have had the dessert with sticky rice a few times and some durian sweets but not the actual fruit. I have seen it for sale many times in Footscray but have always been a but intimidated by it, not to mention wary of stinking up my house. It is known as an extremely strong smelling fruit. My plan of taking Charlie for a late night swim hit an obstacle when after getting her ready and heading up to the roof we discovered the pool was closed! After coming back to the room we decided durian on the balcony was the go. Actually I'm not sure we are allowed to have it in the hotel room so the best option was to eat the evidence. It is a very unusual taste and texture. The taste is impossible to describe but strangely very moreish and the texture is lovely and creamy. Not one if Charlies favourites though as she turned her nose up at it. 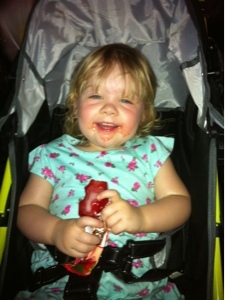 Maybe one day... She certainly didn't have a problem with the icypole we bought her on Khao San road!